The Young European Federalists get on their bikes to discover projects funded by Europe. During the 2018 Europe Week, the Bremen Young European Federalists, a pro-Europe youth group, did a cycle tour to the projects assisted by the European Social Fund (ESF) and the European Regional Development Fund (ERDF) in the west of Bremen (Gröpelingen and Oslebshausen). “Friday, 25 May 2018, 8:30 a.m. The sun is shining and there’s a scent of adventure at Bremen’s grain port as we select our bicycles for our tour of discovery through Gröpelingen. The bikes have been provided and carefully maintained by the “TEAM – Jugend Bremen” support centre, our last port of call today. But first we head through summery Blockland to our first stop, the former Bremen Blockland prison. Today, the barbed-wire fences and colourfully painted gateway hide a small idyll. The massive site, with its rather weathered concrete buildings, hosts row after row of vegetable beds, herb gardens and greenhouses. Assisted by the ESF-Federal programme BIWAQ III (standing for education, commerce, work in neighbourhood III), the 15 participants in the IGEL project (IGEL – German for hedgehog – stands for Integration in Gröpelingen via food and landscape cultivation) of the organiser, Förderwerk Bremen GmbH, cultivate organic vegetables, herbs and fruit here, look after their own bee hives and take care of the hens and wild geese wandering around the meadows. One of the two project leaders welcomes us and guides us around the large site. There is a smell of freshly mown grass. Funding has been provided to the garden behind the former prison walls for nearly five years now. The aim is to give the participants, who consist of former and current prisoners and people in long-term unemployment, new prospects and to help them to structure their lives and become reintegrated into the world of work. This includes learning skills in the fields of organic vegetable cultivation, horticulture and landscape gardening, animal husbandry and beekeeping. Also, a major focus is placed on sharing experiences from the different cultures from which the participants come. The shared lunch with dishes from all around the world, prepared with vegetables grown on site, or tips and tricks like the eco-friendly fight against snails by making a sand channel are good examples of this. The work all around the garden site is dominated by sustainability and environmental compatibility. The irrigation uses ground water; no chemical fertilisers or weed killers are used; the harvested egetables are supplied free of charge to the Bremer Suppenengeln soup kitchens, or freshly processed together with children from the nearby kindergarten and school. The project is rounded off by the attached workshops in which repair work is done for the garden, or a henhouse is built, and by a theatre project against the religiously motivated radicalisation of young people. Impressed by the contrast between nature and the barbed-wire fences, and the indefatigable commitment shown by the leaders, we get back on our bikes and head for the next stop on our tour. With 37,700 inhabitants, Gröpelingen is a particularly colourful, diverse and young suburb in the west of Bremen. The two associations are working to establish and build up a positive image for the neighbourhood, are bringing education, culture and the local economy together, are mobilising residents and institutions for a joint network, and are upgrading the urban structure. They are funded with money from the ERDF (Gröpelingen Marketing e.V.) and from the ESF and the ERDF (Kultur vor Ort e.V.). 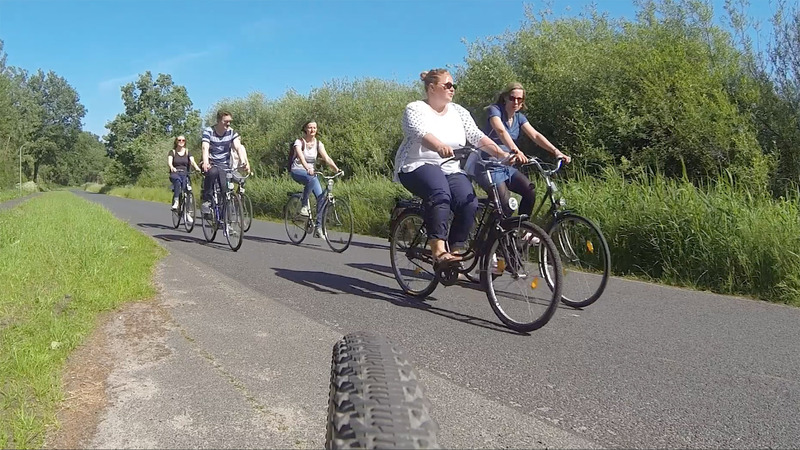 We join two staff members from the two associations to cycle along the lively Lindenhofstraße and keep stopping to learn about the small and large-scale projects. An example is the initiative “Don’t mess with Gröpelingen”. The idea was copied from the U.S. state of Texas. The aim is to keep public spaces in the neighbourhood tidy, so litter can be reported directly by app or phone to the city authorities, who make sure it is cleared up. The United States of America as a model for Bremen? There’s more than one instance of this in Gröpelingen. Public chairs outside businesses and restaurants in Gröpelingen strengthen communication and cohesion in the neighbourhood. As we move from place to place, more and more residents join our little group, listening attentively and telling us about their own experiences. On the square in front of the municipal library, we can try out the free wifi, which is increasingly available throughout the neighbourhood. And there are many other places where Gröpelingen shows how creative and innovative it can be, such as the Gröpelingen Initiative for Start-ups and Small Businesses and the possibility to open pop-up stores in temporarily vacant shops as part of the “Made in Gröpelingen” campaign. And then there is the joint corporate design concept for the businesses on Gröpelinger Heerstraße, or the last farmer in the neighbourhood, who runs his farm right opposite the large Lindenhof-Center. The neighbourhood wants to cast off its negative image, and is making very good progress thanks to the initiatives of Gröpelingen Marketing e.V. and Kultur vor Ort e.V.! Leaving Gröpelingen’s wide and busy main road, we head on through a residential area to the Morgenland Neighbourhood Education Centre (QBZ). This was built roughly three years ago using ERDF funding and has since been operated by Bremen’s Senators for Economic Affairs, Employment and Ports, and for Children and Education. The QBZ aims to use cultural projects to promote language skills. Kultur vor Ort e.V. is managing the substance of the projects, such as “Outreaching educational advice”, which is funded by the ESF. The free advice on questions of school education, vocational training, German language courses and efforts to find internships and jobs is mainly directed at women living in the neighbourhood. Since the project was launched in April 2017, more than 200 people have benefited from the advice. Not least, many local people learn about the structural investment which the State of Bremen is implementing together with the EU. Surprised by just how many small initiatives there are, we break for lunch at Café Vielfalt (Diversity Café) in Lindenhofstraße. The project is run by Waller Beschäftigungs- und Qualifizierungsgesell-schaft mbH (WaBeQ) and offers a cheap nutritious lunch, new job prospects for the long-term unemployed, and a cosy atmosphere for dialogue in the neighbourhood. When we get there, most of the tables are already taken, and the room is full of the sound of people talking. There is a smell of fish. Friday in Bremen. Following a tasty meal, we head off for the last stop on our tour of discovery, back to the “TEAM - Jugend Bremen” support centre on Getreidestraße. Supported by funding from the ESF, young adults aged between 18 and 25 receiving unemployment benefit II can find out about different occupations here, stabilise their individual lives, and build up social skills. The Bremen Job Centre assigns people to the project each month. They are given support for a period of between six and twelve months. Roughly two-thirds of the participants are male, and roughly the same proportion have a migrant background. The 41% of participants with no school-leaving qualification can acquire one under the project. Up to 40% of the young adults who regularly attend the courses offered by the project go on to be successfully placed in vocational training, work or training outside a company. The support centre building smells of metal and fresh paint. In a small room, some 20 young men are studying for their fork-lift truck driving test, which they will take as part of the project. Some of them still look rather doubtful, but the leader assures them that, given the good preparation they get from him, hardly anyone fails. We too leave the building full of confidence and fresh impressions.